Do you know how many people start completing forms on your website, but don’t complete them? Do you know which fields cause them difficulties? This is a guide to field-by-field form tracking using GTM. By tracking each element of the form separately, you will see how many people start filling out the form but then decide not to submit it. Once you understand where people drop off you will be able to identify any parts of the form that may need improving. The enquiry form on our website has four elements that I am going to track: the name, email and subject fields, and the button to submit the query. So to set up the tracking of form fields and submits in GTM V2, follow these steps. Firstly, you will need to enable built in variables. You will need Form ID variable and if similarly to our site you have the same enquiry form placed on several pages, then Page Path variable as well. 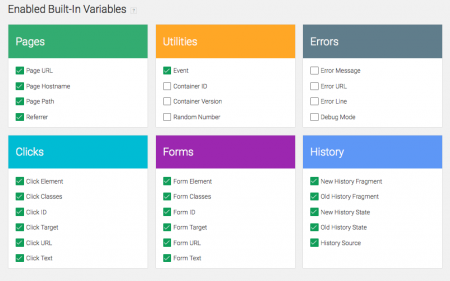 These variables will allow you to track clicks on the form and on which pages the form was clicked on. The page path variable returns the URL part that comes after your main domain, eg /blog. For your trigger, you will need to find out the field ID you want to track. It will look something like id=”name” so name here is the unique ID that you need to use with the trigger. If you do not have a unique ID associated with the field you want to track, ask your developers to add it in. This will make the tracking much easier. Now in GTM, go to Triggers tab on the left and click ‘New’. You are creating a ‘click’ trigger, which you want to fire on ‘all elements’. Go to Tags tab and click ‘New’. Select Google Analytics and tag type ‘Universal Analytics’. 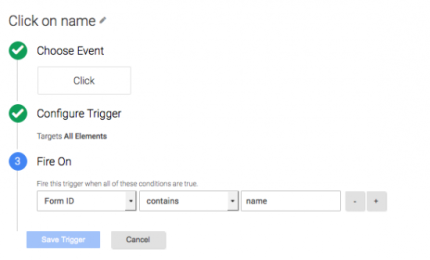 Now select ‘Click’ to select the trigger ‘Click on name’ as your firing rule. If there are any pages where you don’t want this tracked, then you will need to create a separate blocking trigger. Here is an example of a trigger for a contact us page that I want to exclude from tracking here. You can create your blocking trigger in a pop up window without leaving the tag. Follow the steps above to create the trigger and tag for each following field, and amend form ID’s and event field values for each. 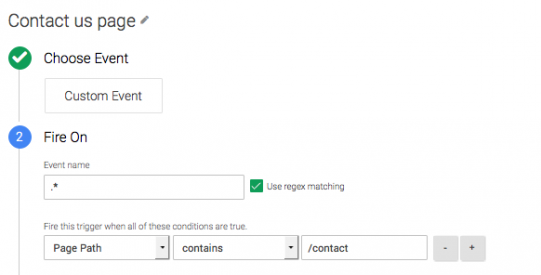 Test your tags in GTM debug mode and GA real time to make sure the details sent through are what you want. Once tested, publish your container and if you need any further help with any of the above, leave a comment below.